That is St. Paul’s question to you and me this evening from the 8th chapter of his letter to the Romans. What then shall we say to this, to the life and to the death of Susan Foster Carr? First, we offer you Scott, you Fr. Foster, you Mr. Foster, to each one of you, Sue’s family members and friends gathered here; we offer you our deepest condolences, we offer you our prayers here tonight, we have come to honor your mother, your sister, your daughter--to honor Sue, and to commend her to our merciful God. But what then shall we say to this? We could start by sharing stories of Sue as a child. Mr. Foster you’ve told me the story of a time you and your family went on vacation from Bedford, Texas, to New York City. As you toured the city, Sue, just a little girl, kept running out ahead of you and your wife, she went further and further, independent, her own person, you were worried, and so just to teach her a lesson you ducked into a storefront, and when she looked back, mom and dad weren’t there. You could see her, but she couldn’t see you! She thought she was lost in New York City! So she ran back, and you came out to meet her, grabbing her by the hand, and she never left your side for the rest of the trip! So what then shall we say to this? We could tell stories of Sue as a caring single mom to you, easygoing, relaxed, a survivor. Scott, I am sure your care and service for others as a Paramedic was learned early on at home with your mom. We could tell stories of how Sue had a knack for welcoming people into her home, she was a caregiver for many. Whoever you were, whatever trouble you were in, whenever you had nowhere else to go, you could go to Sue’s house. There was always a spare bedroom or a spare couch, she would welcome all into her home. And so you presented her with the basics of the Christian faith: that our God, our heavenly Father who created the world has taken on flesh in his Son Jesus Christ. “That the God who did not spare his own Son but gave him up for as all, will also give us all things with him.” That on the Cross Jesus has beaten the power of sin and death forever, that he is risen, is ascended, and is seated at the right hand of the Father, and that he will come again to judge the quick and the dead, and his kingdom will have no end. And even now, to those who believe, in the power of the Holy Spirit that kingdom is already a reality, those who believe and are baptized have already passed from death to life, John’s gospel tells us, death has no more power over those who believe. Death is not the last word, but Life, eternal life won by our Lord who is the way, and the truth, and the Life. You shared all these things: by the gift of faith in the power of the Holy Spirit she immediately confessed her belief in Him. And so the next night, as you all gathered with as a family in that hospital room, Sue was baptized with water in the Name of the Father, and of the Son, and of the Holy Spirit. She wept---all her burdens lifted and nailed to the Cross. All the promises of God, poured out by not only a priest of the Church but by her little brother. You as a family printed out a certificate of baptism, which sat framed on her hospital room wall. She pointed to it often and said, “That’s how I can sleep at night.” Her appearance changed, as you said, from night to day, her life had changed forever, her eternity was secure. Indeed, marked with the cross of Christ forever in baptism, that’s how all of us can sleep at night--and also live our lives during the daytime too. Sue teaches us, that we too ought to weep at the gift God has given and promises to us again and again. St. Paul asks us tonight, “What can separate us from the love of Christ?” “Shall tribulation or distress or persecution or famine or nakedness or peril or sword?” We might ask the same thing: What can separate us from the love of Christ? Shall surgery or hospitalization, shall suffering, or difficulty, or even death itself? No, in all these things we are more than conquerors through him who loved us. Tonight, Sue is numbered among those in the Church triumphant who are more than conquerors through him who loves us. For the faith that sustained Sue when all other helpers were gone, is the faith we cling to for her, and for ourselves, and for the whole Church. That we are sure, that neither death, nor life, nor angels, nor principalities, nor things present, nor things to come, nor powers nor height, nor depth, nor anything else in all creation will be able to separate us from the love of God in Christ Jesus our Lord. As we gather tonight in Eucharist, as the bread and wine become for us the body and blood of our living Lord, Sue is here, together with all the saints of every time and every place, a great company too many to number; all our loved ones who have gone on before us in faith; this is where we meet. Though the altar rail is wide here it becomes wider still as this heavenly banquet spreads out through all eternity. A feast to celebrate that because of what Christ has done, death has no more power over us, a feast to prepare us for that great and final day when the Lord will wipe away all tears from all faces. A feast to celebrate Sue’s entry into her Father’s house, a house Jesus tells us today has many mansions, many rooms, for her and for you and for me. Christ has gone to prepare a place, to ready her a home, to make ready a place for you and me too, so that where he is we will be also. So what then shall we say to this? To a woman and a mother who cared for all, who made her own house a place of welcome, to a woman whose wanderings finally led her back into her Father’s arms, now we entrust her him, to our God who has prepared a place for her and will come again for us as well. Last night at 5:31PM the Lord called my sister, Sue, home to His bosom after a battle with cancer. Sue was discovered to have a very large brain tumor in May. A couple of days after surgery to remove the tumor she was surprisingly alert, fully conscious and surely in her right mind. And her mind had been at work on those questions every human being must ask themselves about life and its meaning. And their own mortality. The result? After more than twenty years of evading my every attempt to discuss matters of faith with her Sue surprised me and my father by asking --out of the Blue-- "What would I have to do to be baptised?" I nearly fell out of my chair! Sue had never given any indication of an interest in talking about the Faith before. So I spent quite a bit of time presenting Sue with the Good News of our Savior and reminding her of the need for repentance and a firm commitment to follow Jesus as her Lord. When I had finished speaking Sue clearly and without hesitation professed faith in Jesus Christ as her Lord and Savior. She was baptised in her hospital bed the next night with much of her family in attendance. It was my honor and joy to administer the Sacrament of initiation. For a while it looked as if Sue might make a reasonable recovery. But that was not in the Lord's plans for her. I rejoice to know that my dear sister rests comfortably in the Lord's presence tonight. Your prayers for the repose of her soul and peace of mind for her family would be cherished. A Requiem Eucharist will be celebrated for the repose of Sue's soul at St. Vincent's Cathedral on Wednesday night at 7PM. 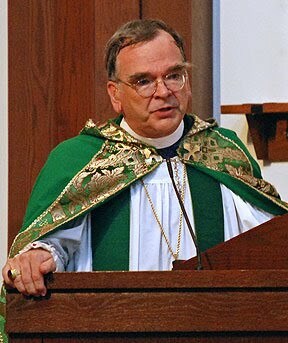 Archbishop Robert Duncan of the Anglican Church in North America will be celebrant at a special Holy Eucharist at St. Vincent's Cathedral this Friday evening at 7PM. All are heartily invited to attend!